It was a beautiful, sunny, summer day in New York City, a perfect day to stroll the Union Square market. Saturdays are by far the busiest day with the most venders. My favorite markets are Monday and Wednesday when the crowds aren’t so thick and when some of the smaller farmers who only come to the market once a week are there. Today I went with the intention of getting flowers so the house would look nice for Neil when he arrived back from his two-week trip to Australia. Of course, I never do seem to go to the market (or a grocery store) without picking up several things I had no intention of getting. In the past couple of weeks rhubarb has been scarce and what there was looked pretty thin and picked over by the time I arrived. Today I noticed one of my favorite vendors had beautiful thick stalks of rhubarb so I went over grabbed the ones above and gave them to the farmer to weigh. 1.8 pounds. $11. I nearly fell over. 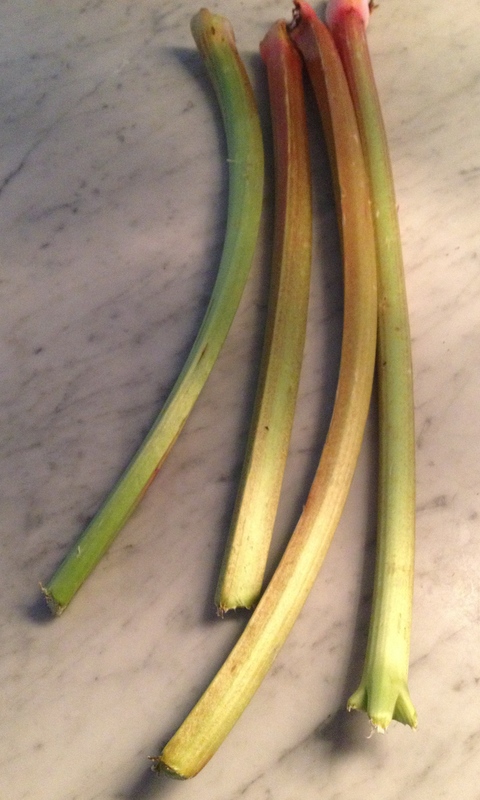 Rhubarb is a weed that used to grow in the abandoned yards around my grandmother’s house, thriving, unattended. The vendor I bought this from proudly doesn’t use any spray of any sort on any of his produce. I chalked it up to a donation to a good cause and walked away (with, of course, some tasty rhubarb). On the other side of the market I then bought some Peonies. They cost $10 for 5 stems, I didn’t think anything about paying what I felt was a fair price for them. Why was I shocked by the $11 for the rhubarb yet gladly paid $10 for the flowers? Flowers are a luxury. Is rhubarb, well-grown and brought to the city by a dedicated farmer, who grows produce to a higher standards of sustainability and purity than almost any other farmer who comes to the markets in this city, worth less? Is $6 a pound for rhubarb too much? Or is it simply the price that you pay to have a farmer grow it who is dedicated to pesticide and chemical free farming? This entry was posted in NYC, Recipes and tagged rhubarb, sustainable farming, Union Square Market, urban sustainability. Bookmark the permalink.